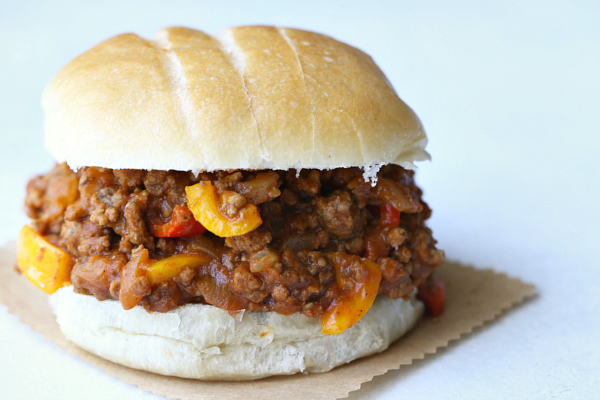 Sloppy Joes get a healthy, Fall, slow cooker, makeover! 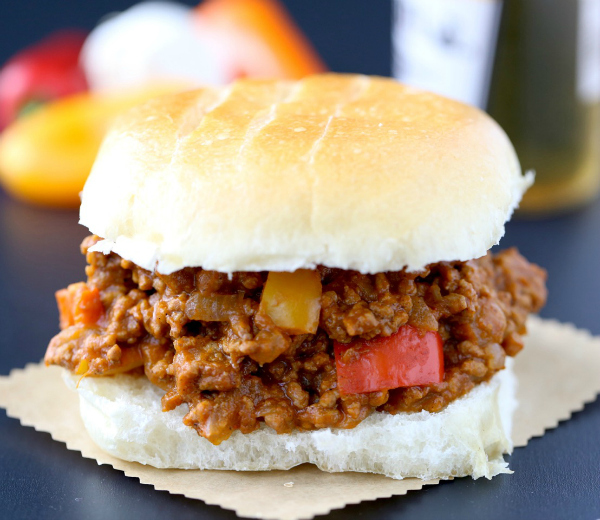 You’ll love this easy, delicious & healthy Pumpkin Sloppy Joes recipe…made right in the crockpot! You guys! We’ve been absolutely loving this easy Pumpkin Sloppy Joes Recipe! It’s been an at least once a week meal around my house and has quickly become a family favorite. 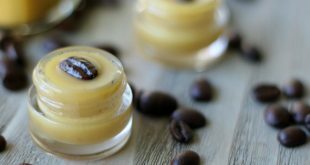 Plus, this recipe really can’t get any easier. You literally just dump everything in the crockpot. And then come home to an amazing smelling house complete with dinner (or lunch!) ready. Gosh, I just love easy recipes like that. And if you’re thinking what my husband first thought when he saw me putting pumpkin in my Sloppy Joe recipe (truthfully, he was horrified haha), just trust me on this. It’s ridiculously good. And yes, it tastes the same as regular Sloppy Joes (actually Zach thinks it tastes even better! woo! ), but with so much added nutrition from all that pumpkin-y goodness! Pumpkin is such a wonderful source of nutrition. That’s why I was thrilled when I realized I could add more pumpkin into my life with this yummy Sloppy Joes recipe! We love to serve our Pumpkin Sloppy Joes on gluten free rolls or a baked potato and sometimes we just scoop it up with tortilla chips 🙂 So, so good! I hope you get a chance to try my easy Crockpot Pumpkin Sloppy Joe recipe – I think you’ll really love this one! Add all the ingredients to a slow cooker and cook on high for 3-4 hours or low for 6-8 hours. Then, remove lid for 30-45 minutes so any extra liquid can evaporate. Enjoy! This looks absolutely delicious! 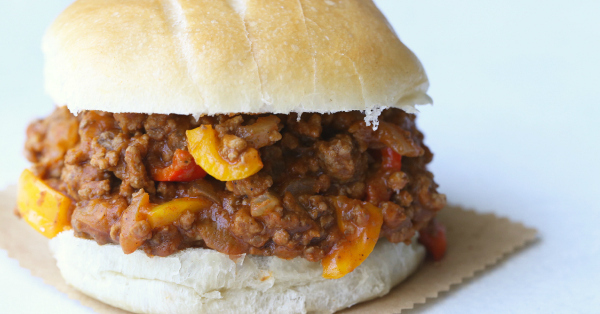 I’ve been looking for a healthier sloppy joe recipe for my family and this is perfect – even better with pumpkin! Yum! I hope you all enjoy, Erika! What bread recipe did you use? Did you cook the ground beef prior to putting it in the crockpot, or do you add it raw? Nope, I just add it raw! Awesome! I’m going to try this one tomorrow over baked potatoes. Thanks, Kelly! Definitely trying this one, Kelly! I even have some ground beef with 20% organ meat in the freezer which would be great for this. Love the idea of sneaking in a little pumpkin! Made the ketchup today…..so good…….making sloppy joes tomorrow, thank you for sharing! Do you have nutritional value on this? It was so good! haha I agree, Bethany!! And we’re trying to do the same thing over here. Ever since I discovered a good gluten free bun/bread from a local gf bakery, I’ve bought a pack every week! We’re trying to cut back, too….it’s not really working well, though. It’s SO good and so convenient, ugh! But I agree, sloppy joes on a bun are totally worth it!! I hope you enjoy it as much as us, Brooke! Thanks for the work you do….I made 2 of your recipes tonight and they were both do darned good! Hi Cara! I’m so glad you enjoyed the flavor and could find ways to make it work even better for you! Woohoo! My daughter and I just put this in the crockpot. We can’t wait to try it for dinner! Hope you both love it, Mary! This was a real winner. I served over a baked sweet potato. Thank you so much!! !